Just as the month of January brings the typical frenzy of diet ads that bombard us from the airwaves, magazine covers, and the Internet, there has also been a report making its rounds in the media that claims fewer women are dieting this year. According to research by NPD, a global information company that tracks Americans’ dieting habits, 23 percent of women said they were dieting today as compared to 34% in 1992. New acquaintance (NA): So, what kind of work do you do? Me: I’m a therapist who specializes in eating and weight struggles. NA: You must be really busy. There are so many people who need to lose weight. Me: Well actually, I take a different approach. I help people to stop dieting and to feel stronger in the body that they have. NA: Oh, I know. You shouldn’t diet. You just have to eat healthy and then you’ll lose weight. Here is my definition of dieting: Any time food is manipulated for the purpose of weight loss, it is a diet. It’s important to acknowledge how difficult it is to break the diet mentality given the fat-phobic culture we live in. Sometimes it operates at such a subtle level that people aren’t even aware it’s there. For example, one of my clients became adept at eating when she was physically hungry and eating foods that felt like a good match to her. But she kept finding herself eating well past fullness, and she ended up feeling physically uncomfortable. As we explored her situation, she realized that at some level, she was telling herself it would be better to stop before she felt full because she believed it would lead to weight loss. The minute she had that thought, she felt deprived, which then compelled her to eat more than she needed! 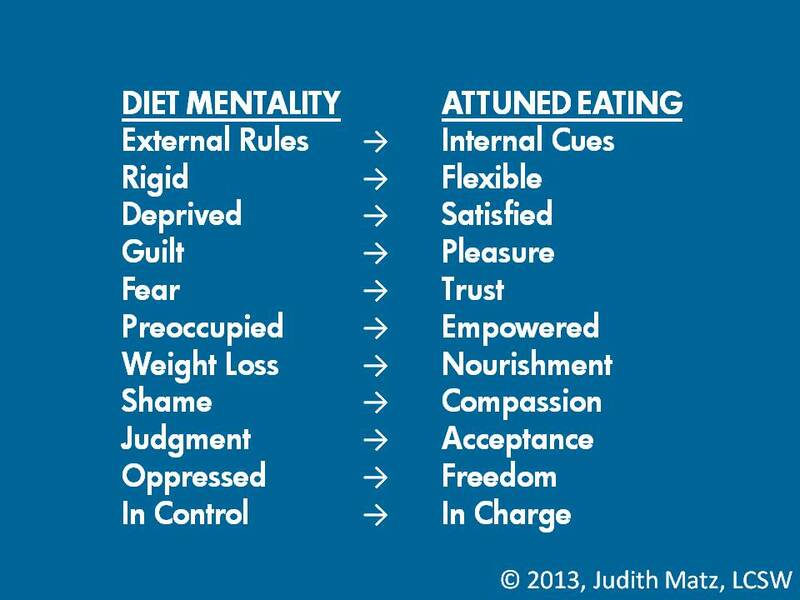 Once she became aware of her subconscious diet mentality—and reminded herself that she deserved to eat as she much as she needed to feel comfortable—she was able to listen more accurately to her cues for fullness. No matter how much any of us embrace the Health At Every Size® approach, it’s hard not to feel the diet fervor in these first weeks of the New Year. When I was invited to write this guest blog, one of the questions posed to me was how I deal with the all of the diet and body rhetoric at this time of year. My simple answer is that I tune it out. I don’t watch much TV or read the women’s magazines, and I don’t read blogs or visit websites that promote dieting. Because I work in my own private practice, I’m not subject to the diet conversation that often happens in the workplace. I also try to put something out in the world each January that will be an antidote to the weight loss madness; this year I wrote a press release entitled, Body Confidence is the New Weight Loss Resolution. It’s always a thrill to hear that someone has quit dieting. If this truly is a trend, I’m pleased to know that real change is occurring. At the same time, according to the NPD study, almost one in four women still diets today. Unfortunately, that’s still too many. The NPD Group reports dieting is at an all time low-Dieting Season has begun, but it’s not what it used to be! [Online]. The NPD Group. Available: https://www.npd.com/wps/portal/npd/us/news/press-releases/the-npd-group-reports-dieting-is-at-an-all-time-low-dieting-season-has-begun-but-its-not-what-it-used-to-be/ [2013, January 7]. Gaesser, G. (2002). Big fat lies: The truth about your weight and your health. Carlsbad, CA: Gurze Books, p. 144. Expect Amazing. [Online]. Weight Watchers.com. Available: http://www.weightwatchers.com/templates/marketing/Landing_1col_nonav.aspx?PageId=1397521&cid=ps_brnd [2013, January 17].